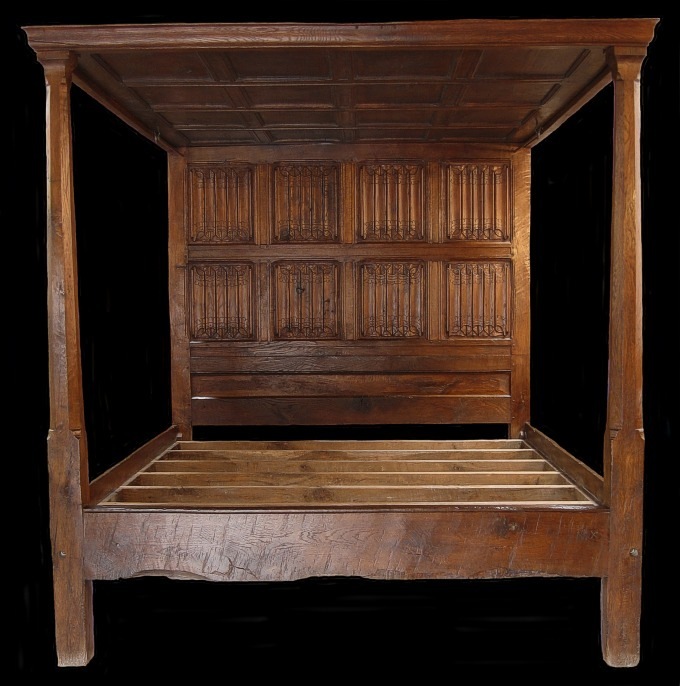 16th Century style four poster bed with linenfold panels, hand-made from reclaimed ancient oak. By hand-made we mean all the components were individually cut from selected old beams, using hand-held tools and then either hand-scraped or hand-planed. The period mouldings, and there are ninety three on this bed, were each cut using workshop made scratch stocks. The cornice was finally shaped using old moulding planes. Each linenfold panel was individually hand-carved and hand-fitted into the framework grooves. The mortise and tenoned framework, making up the headboard and tester ceiling, is held together by the drawer bored and pegged method, exactly as it was done in the 16th Century. We have retained as much of the beams original pit sawn surfaces on the reverse sides of the bed and any newly cut surfaces have been treated to blend in perfectly, to give an overall 'untouched' patina. Hand-finished to a lovely rich period oak colour. Over four hundred hours work, this is a level of replica early oak furniture making probably not seen anywhere else today and represents the very pinnacle of our craft.